For the saltwater aquarium hobbyist, there’s no shortage of beautiful saltwater angelfish to choose from to beautify their home set up. 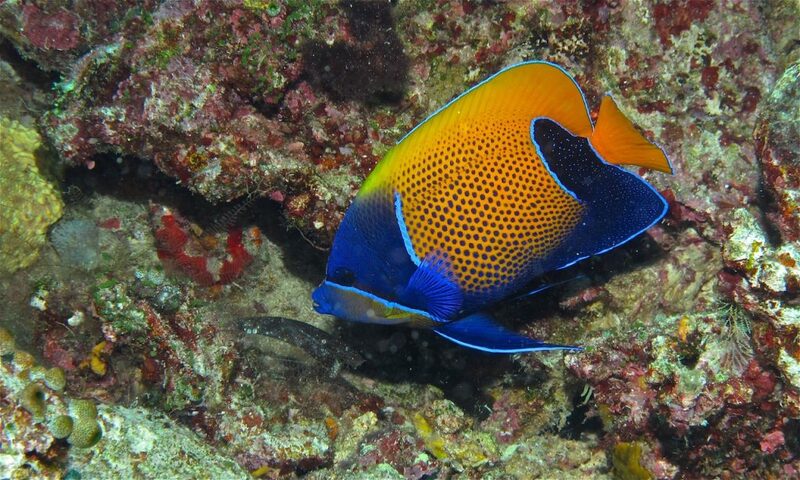 And one of the most beautiful saltwater angelfish you’ll find is the Blue Girdled Angelfish (Pomacanthus navarchus) or sometimes known as the Majestic Angelfish. What makes this fish so striking is the gorgeous coloring. It has a bright yellow/orange and blue color pattern. Yellow/orange around the mouth, blue around the eye and bottom and a bright yellow/orange in the middle, which is said to give it a ‘girdled’ appearance. Further enhancing its beauty is neon blue ‘pin striping’ outlining the fins. Like many species of saltwater angelfish, the juvenile blue girdled angelfish looks quite a bit different than what it does when it becomes an adult. The juveniles are black with light blue vertical stripes. 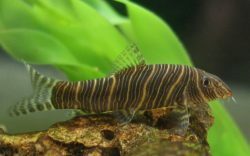 This fish grows slowly, and remains at about the 2 1/2 to 3 inch size for awhile, which can fool people into thinking that to be its normal size, however, once fully grown, it can reach sizes of up to 10 inches. In the wild, the blue girdled angelfish can be found in the waters of the Indo Pacific Ocean and Krosae in Micronesia. Because this fish can grow so large you’re going to want to put it in a tank of at least 100 gallons if you’re housing a single blue and at least 135 if you’re housing two. 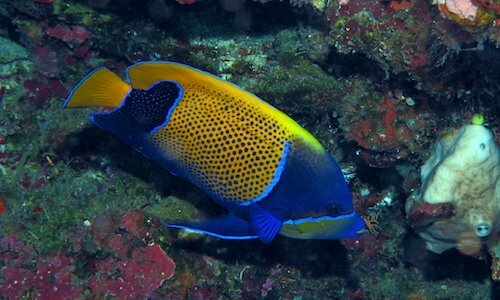 As with most saltwater angelfish, the blue girdled angelfish needs to be introduced into a tank that’s been established for at least 6 months. The water conditions this fish prefers are a temperature range of 72 – 82˚ Fahrenheit, pH 8.1 – 8.4, medium water hardness, and a specific gravity of 1.023 – 1.025. Many species of saltwater angelfish don’t take well to changing water conditions, and this fish is even less tolerant than others, which makes this variety more suited for the intermediate to advanced hobbyist. In order to keep this fish healthy and happy, you’re going to have to stay on top of maintaining high water quality and ensure fluctuations are slight and kept to a minimum. Experts recommend water changes of 30% per month or 15% every two weeks. In addition, if your set up contains corals, you’re going to want to do a 20% change every month or 10% every two weeks. It’s also important to take into consideration the bio load this large fish is going to place on your tank. 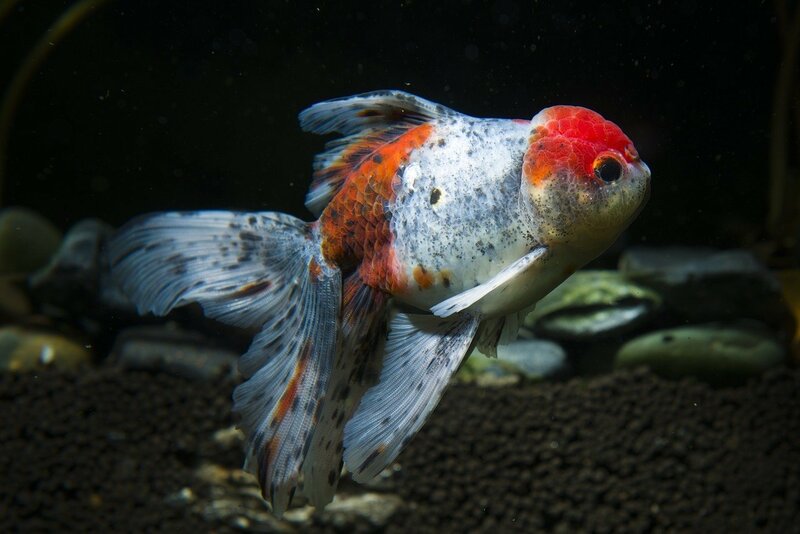 Being a big fish, it’s going to take in a lot of food, which means a lot of waste, and if you’re housing it in a tank that’s too small, your tank can get foul in no time. Be vigilant about water testing and make those water changes as scheduled to keep things in proper balance. When you first introduce the blue girdled angelfish into your tank it’s going to be very shy. In fact, this is one of the shyest species of saltwater angelfish out there. However, once this fish becomes accustomed to its new surroundings, it can become aggressive towards tank mates that are added later. In addition, like many other saltwater angelfish, it doesn’t tolerate other angels unless it’s a mate of the same species. In the wild, these angels like to graze algae on rocks, so you should consider providing them with plenty of grazing area and hiding places in their new environment. Lastly, you need to provide these angels with sufficient lighting to help them from getting Head and Lateral Line Erosion Disease and to encourage algae growth on the rocks. 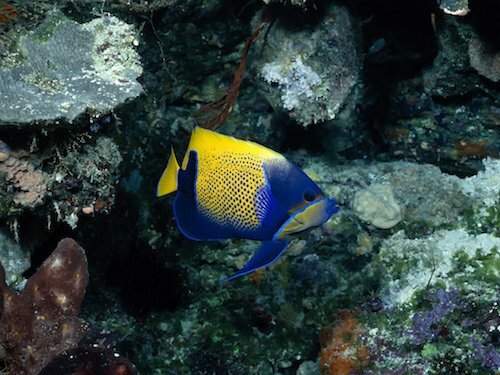 As with many saltwater angelfish, the blue girdled angelfish is susceptible to a variety of diseases and parasites that plague saltwater fish. The most common of these disease is White Spot Disease (Cryptocaryon irritans) or Marine Ich or simply Crypt. This disease manifests itself in white spots that cover the body and symptoms include the fish scraping themselves against rocks. Another common disease that can affect these fish is called Marine Velvet (Oodinium ocellatum). This disease manifests in a brownish ‘velvet’ coating all over the fish’s body, clamped fins, difficulty breathing and weight loss. Most of these diseases are brought on by stress, which can be caused by rapidly fluctuating water conditions, being housed with overly aggressive tank mates or not providing a healthy diet. Most saltwater angelfish are omnivores and the blue girdled angelfish is no exception. In the wild these fish dine on a variety of sponges and tunicates, which make up the bulk of their diet. In your home tank, you can keep them happy by giving them a varied diet of live and frozen foods as well as fresh meat such as chopped squid, scallops and shrimp. Live food can include worms and shrimp. They will also accept a high quality prepared food that contains sponge or tunicates, as well as food that contains color enhancers. For best results, most experts say to feed these fish 3 times a day. When you first introduce these fish into your home tank you may find that they’re not eating. If this happens, try giving them live brine shrimp, red macro algae or clams. As of this writing, the blue girdled angelfish has not been successfully bred in captivity nor has tank raising these fish been successful either. 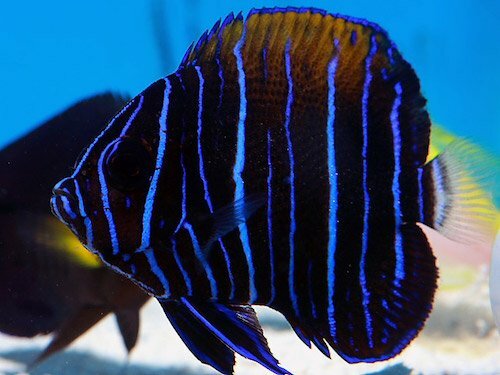 While the blue girdled angelfish can be difficult to keep, it’s worth the effort due to the sheer beauty of seeing one of these elegant and majestic fish gliding through your home aquarium. 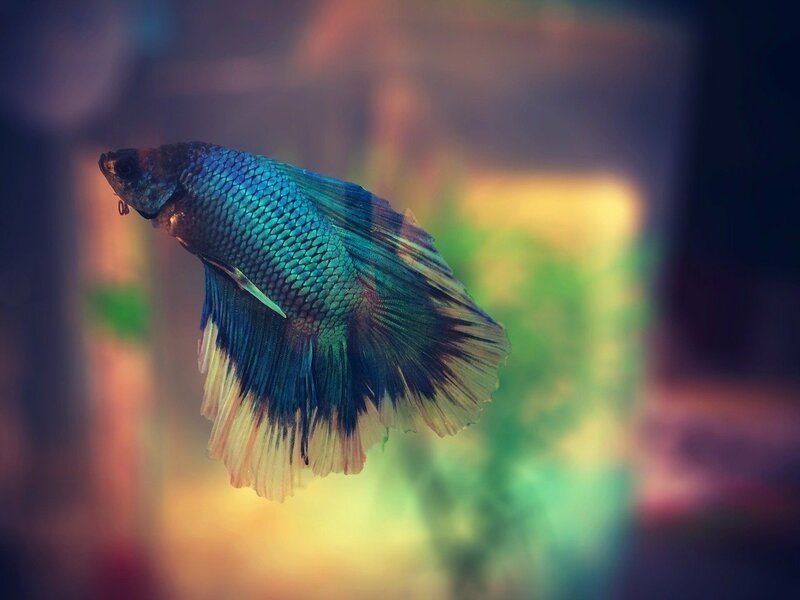 The rich, vibrant colors make this a great living decoration to your home, and if you work hard at maintaining good water quality and optimal living conditions, this fish will reward you for years to come.